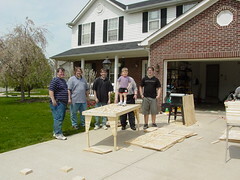 Paul, Joe, John, & I started building train tables today for the club (COLTC). We picked up the wood from Home Depot to make 18 tables. Everthing is cut; now all we need to do is assemble the tables... about another day's worth of work. We should have enough tables for the Dennison, OH train show... It was about a year ago that we made our initial tables for the club. Erika bought me for my birthday a Toro gas powered weed-eater. I'm happy!